In 1961 President Kennedy urged us to ask ourselves what we can do for the country. It was a call to serve however one could. Many heeded the call and still do. For a lot of us it's part of our DNA and an essential question for our lives. 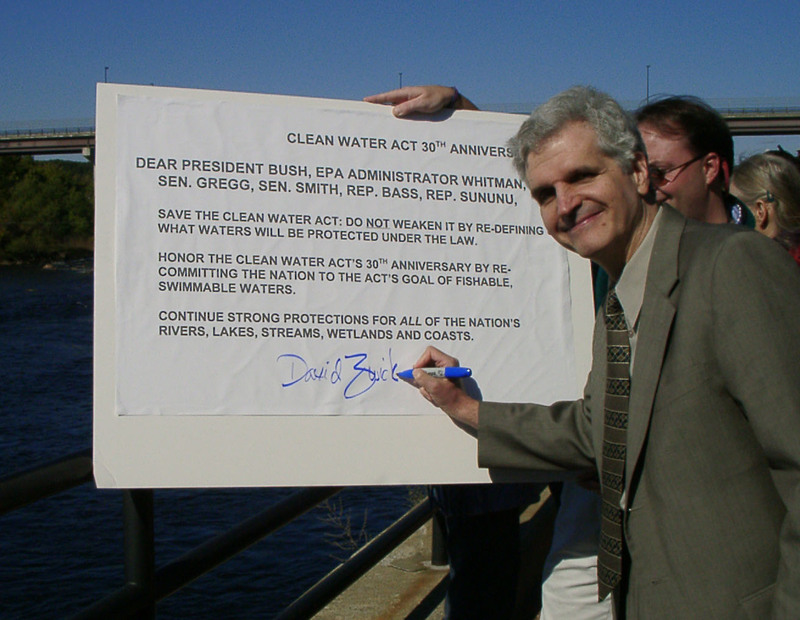 Clean Water Action's founder, David Zwick, was 18 when the President made that plea. David answered by getting to work. And once he started, he never really stopped. He began in the military, serving two tours in Vietnam. He then went on to law school and followed that with a lifetime of fighting for the public interest. It was at Harvard in 1969 that David took an assignment from Ralph Nader to lead a team to investigate the state of our nation’s water. When he started he thought he would find that water pollution "was a problem that a few little lifestyle changes could solve." What he discovered was something else entirely. David and his task force of researchers found industries allowed to pollute with impunity, dumping cancer causing waste like lead, arsenic, and mercury directly into our water; He found water systems that weren't able to properly treat the waste to produce safe drinking water; He found that our water and our health were at risk. After two years David and his team reported on the study with the groundbreaking book. He published Water Wasteland with Marcy Benstock. It was front page news in 1971 and became the starting gun for Congressional efforts to pass the Clean Water Act. For me, the realization was sitting at a Congressional hearing and watching Members of Congress walk by with their arm around some corporate lobbyist who’s getting paid $500 an hour to delay pollution controls. David took his report to DC, pounding on the doors of Congressional offices, making sure they read Water Wasteland. He testified at Senate and House hearings, demanding that our elected officials pay attention to the concerns of everyday Americans and act in the public interest, not the polluters'. But he was up against organized and moneyed special interests ─ many of the same forces that we're still fighting today ─ and he knew that Congress wouldn't just pass the Clean Water Act because they thought it was a good idea. He recognized that, sometimes, Representatives and Senators had to be dragged kicking and screaming to do the right thing. He couldn't drag Congress on his own. So he built a movement. I think it will take enormous force to make that change, and the only force capable of making that change happen is an organized and enlightened citizenry. David believed in people. He believed in organizing. He understood that the only advantage we have over special interest money is strength in numbers. David, along with a few others, founded Clean Water Action in 1972 (then called the Fishermen's Clean Water Action Project) with a grant from a fishing tackle manufacturer. He and his team continued to work the halls of Congress in support of new pollution laws. They started educating the public and found new ways to engage and activate people, to grow and strengthen the movement for clean water. And it worked. Congress passed the Clean Water Act in 1972. Several parts of the Act, including the landmark Citizen Suit provision which allows Americans to sue polluters who are putting our water at risk, were written by David. It was a huge victory and a lot of lessons were learned. The most important was that powerful industries have amazing access to lawmakers thanks to deep pockets and the only way to counter that is through education and organizing. So David and the team kept working, building power and expertise. In 1976 Clean Water Action opened its first canvass, pioneering a new way to engage Americans, educate them, and get them to advocate for their families and their communities. To this day door-to-door canvassing is the centerpiece of Clean Water Action's theory of change and the reason we keep on winning for our water. The best way to anticipate the largest underlying problem is to build a citizens' movement that makes democracy work better. That democracy has to be able to strike the right balance between allowing entrepreneurs and businesses to develop solutions to problems, while curbing these horrible abuses. This organizing got Americans from coast to coast and everywhere in between involved in some of the most consequential environmental and public health campaigns of our time. It tipped the scales and helped us beat back entrenched interests in Washington DC and state capitols. It helped us enact bedrock protections for our water and health that endure to this day (even if they are under attack right now). Throughout the 70s, 80s, and 90s David built Clean Water Action into a grassroots powerhouse. Under his leadership the organization achieved many important victories ─ helping to pass the Safe Drinking Water Act, strengthening Superfund, and leading a War on Waste to name a few. Clean Water expanded, opening offices across the country, winning campaigns to protect the Chesapeake Bay, to safeguard land and water in Maryland and Minnesota, securing a ban on oil drilling in Virginia, helping shutdown trash incinerators in Massachusetts, and so much more. People's active participation makes a huge difference in how elections turn out. This is a time to ask questions, find the facts, form your own option, talk to others. Understanding that to make lasting change, you also have to elect lawmakers who will join in the fight to protect clean water and public health, David and the Clean Water team turned to electoral politics. They took the lessons learned from the campaigns to pass and defend laws like the Clean Water Act and began electing leaders who would put the public interest first. This pioneering model of campaigning is now recognized as the best way to win and has led to the election of clean water leaders like Senator Elizabeth Warren, Paul Wellstone, President Obama, and countless state and local elected officials. People power. Grassroots engagement. Strength in numbers. That's how we win the big fights. David's influence on our water is hard to overstate ─ our water is cleaner and safer today because of David. But his impact on our democracy is equally important. He and his team changed how we interact with our government, and the way we get involved in the most important issues of our time. It's a legacy to shout about from the rooftops. But David has another legacy ─ all of us. David mentored so many people. These people have gone on to lead organizations, get elected to office, and run agencies like EPA. Some took the skills and knowledge they learned and organized other communities on other major issues. Some are still fighting to protect clean water right here, at Clean Water Action. The map of David's influence is ever expanding. David taught a generation of activists who taught a generation of activists who will teach the next generation of activists. David's influence will live on every time someone with a clipboard knocks on a door and asks the person who answers for a moment of their time. His presence will be felt whenever an individual or community group uses the Clean Water Act to sue a polluter for putting their water at risk. David was an organizer to the end. During his last months he brought people back together who hadn't seen each other for years. The community that came together to support David and his family is huge. David touched the world. And we won't ever forget him. David knew that an organizer's job is never really done and he made sure everyone knew that. We can’t get comfortable just because we won one fight, or two, or ten. We have to keep organizing and educating and engaging. We have to stay involved. It's the only way to protect our water, our health, our families.